I have to admit that I know nothing about office politics and have made some horrible mistakes — the main one of being totally honest and pulling away and being seen as arrogant. After working for 16 years for a small company, I was forced by the owner to leave. He called me in one day and said that I had had trouble with almost every other coworker. This was not true and my coworkers did not want me to leave the company. Although I knew why he was doing this — because he had decided to sell this business and I was a six figure income expense — I told him on the second office call that I would not walk into this again and would leave the company. He was so overjoyed that he could hardly keep his composure. With my income expense gone, it made the company seem much more profitable for an interested buyer. I then went to work for a large chain corporation and found myself in a pool of sharks where state regulations were being looked upon with great disdain and the climate was ethically horrid. I am a woman in her forties and found myself being lied about by a twenty something coworker. I discovered through company email to our immediate supervisor that this young woman was claiming that I was breaking the law and making clients angry (she actually accused me of what was happening with her). The emails contained winks and other innuendos which appeared to relay some form of relationship with this man. To say the least, I got scared and ran but not before I made a huge mistake of calling human resources — they were just as corrupt as the rest of the company. Recently I started a new job and am trying to be friendly but not give away any personal information about myself and just fit it. I do not want any more problems but do not want to seem too distant either. On my third day, a coworker (who is my equal) asked me to do something blatantly against the law and I refused. When I did this, he said it was the company policy and ranted for the next three hours — calling the supervisor and other colleagues to discuss the matter. Please help me. I need to know how to survive and keep my job because I am not in a position to start my own business. Unfortunately, as you have seen, now in three different situations, these “strengths” can become liabilities, or at least vulnerabilities. This last component relating to values is what we suggest you focus on more proactively. There are some people whose values are almost non-existent. For example, Groucho Marx once remarked, “These are my principles. If you don’t like these, I have some others I can show you.” Someone with these ‘flexible’ principles can actually work anywhere because they are unlikely to have a values conflict or integrity concerns. Their company’s products and services may not benefit society, their company may deceive consumers, etc and it won’t bother them. Obviously, you are at the other end of the continuum. So, for you, it is vitally important to really investigate the type of company you join and maybe even the type of industry in which it resides. Companies that provide beneficial products and services, treat their employees respectfully and are good corporate citizens in their communities are a good place to start. Of course, this advice applies if you move on from your current situation. If you stay, we suggest that you do some personal reflection. Are you too “black and white” in your thinking, with little room for “gray”? Are you too quick to label something an “integrity issue”? Please investigate, with curiosity and an open mind, what are your company and industry norms. It is possible that you may find some room for flexibility on your part that would allow you to stay. If not, your situation becomes increasingly difficult because your co-workers will feel you are accusing them of having low integrity. If you can’t find a compromise you can live with, please do the research to find an organization that matches your values. 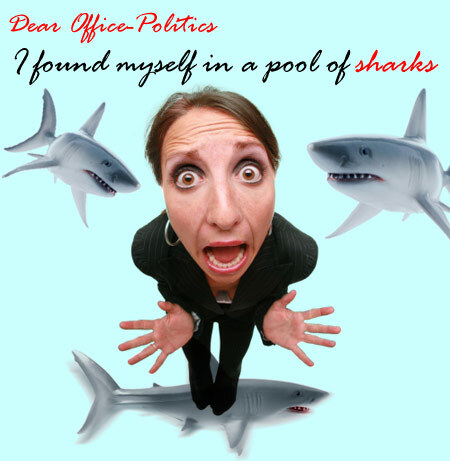 Thanks for writing to Office-Politics.com. I read your reply and feel that it hit the mark. come off as insinuating that my coworkers have lower integrity than myself. Groucho Marx’ quote seemed to be extremely accurate as to the type of environment I have encountered. Thank you so much for your insightful input to my dilemma! One of the office problems that i have is that i keep getting over looked for raises or other opportunities within the company and i don’t know how to approach my boss about it. Hi. I’m a misfit. I have been fired from my last two jobs. I work in advertising. I always seem to end up on the wrong end of office politics. I have noticed that I am consistently blamed and vilified. I always try to turn conflicts into positives/wins, and I seem to always wear the bigger shoes. I try to do the best thing for the company. But I find I become targeted, and when I advocate for myself it only makes things worse. I’ve just been offered a new job and frankly I don’t know if I can accept it. I can’t go through this again. This is devestating my self-esteem. In my last position, there was a core group, an “inner circle” of people who had power. My boss and her best friend were in that group. My boss’s best friend hated me, although she couldn’t tell me why. Once she said it was because she didn’t trust me and that I would have to be honest with her, then she changed her mind and said it was because I didn’t respect her authority, then she changed her mind and said it was because I was defensive. I was dumfounded. I had been bending over backwards to ensure she saved face after she lashed out at me in front of others in emails and meetings over and over again. She kept making a fool of herself and I kept digging her out. My boss offered NO support, saying this was her friend and that I seemed to have problems with everybody and that if I wanted to be a success at the company I would have to win over the right people. Well, I didn’t win them over. And I got canned. I have noticed that as soon as someone in a key position of power turns on me, others quickly jump in line behind him/her. It’s like they just want to be on the side of the powerful, and are just grateful it is not them being targeted. From there, people start to watch for any little thing they can twist or distort to try to make me look incompetent, discordant, or like a source of conflict. It quickly sprials out of control. I am fired within 1.5 years. Thing is, I AM good at my job. I AM honest, and extremely fair-minded. I DO have integrity. I do NOT seek out or create conflict. I’m just a square peg; an easy target. I constantly ask myself, what is wrong with me? I over-think and second-guess every single thing I do. I’m almost paralyzed by this. Thinking back over my life, I have always been an outcast. I have no idea what to do. Your letter is me all over. I ask the same concluding question. Now have been canned, but am fighting it out in court. Who knows to where it will lead except to say that am standing uip for myself. same story as mine . I’ll learn from this and not go to HR. I have found that I have the same issue and I think the problem is narcissism. People don’t want you to be positive all the time and people don’t want you to have the “answer” or be the “Team builder”. People want to be miserable and complain and usually enjoy picking on someone. What I have learned to do is to tone dowm my positivity and not give “advice”. When I see other co-workers not getting along and hear them talking about each other I say nothing. When I come to work in a good mood, I just keep it balanced and don’t try to be “too happy” because you make yourself a target and as soon as someone says something negative about you to the group you’ve lost. Because anytime you try to stick up for yourself you look like your “Dwelling” on it. Sarah’s comments are just so true. It could be me writing that. I am 54 and I have never held the same position longer than 22 months! Finally, I decided to stand strong, like the scorpion who backed in to a corner comes out fighting. I rarely share my personal life at work, and I tolerate the separation that it gives me from the other workers: it is a small price to pay for being extremely good at my work, and maintaining a position that can be only criticized from popularity and not from performance. There is always a bully in the workplace: my maxim is that I never work in an environment of only women (unless short term), and I make friends in the wider fraternity of the organization and not in the immediate workplace. I am currently job hunting again: both my superiors are corporate psychopaths, and I’m past the 15 month mark! I just want to get my pension!! Can’t they get along with me for four more years?? ?